One electric grid territory, called PJM, serves approximately 60 million people in Pennsylvania, New Jersey, Maryland and ten other surrounding states. The PJM electric grid will generate more than 247 million metric tons of carbon dioxide in 2013. That’s 0.74% of the planet’s total of 33.5 billion metric tons . Needless to say, cleaning up the electric grid in this region is a good place to start when combating climate change! So, where exactly do the emissions come from? In short, coal and natural gas. And a disproportionate amount to boot. According to the EPA, the average coal plant produces 2,249 lbs of CO2 for every MWh that is generated, and the average natural gas facility generates 1,135 pounds of CO2 for every MWh generated  . 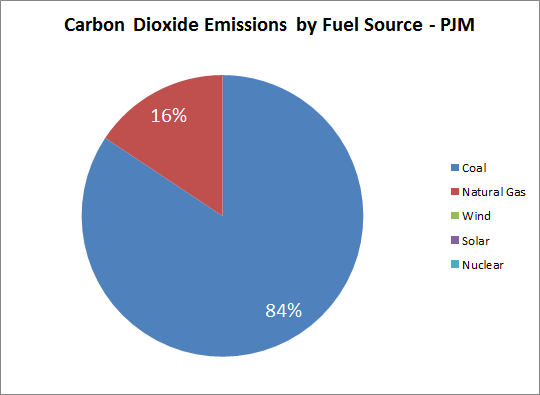 With a little simple math, one can determine that about 84% of the 247 million MT of CO2 in PJM come from coal, and about 16% come from natural gas.  . Meanwhile, wind, hydro, solar and nuclear contribute approximately 38% of PJM’s electricity, yet contributed exactly 0.00 metric tons of carbon dioxide. We can build a clean grid that uses predominantly renewable energy. Find out more about solar for your rooftop, or green community electricity for your home. Together, we can overturn our electric grid.